An approach to optimizing the flux linkage of the rotor of an induction motor is considered when the motor operates in a vector control mode with indirect orientation in the direction of the field. In this system, the expression for the frequency of the rotor e.m.f. contains the rotor winding impedance; this impedance must therefore be precisely estimated in real time. It is proposed that this should be done using a fuzzy-logic adaptation mechanism. The results of using such a mechanism in a physical model confirm its effectiveness. 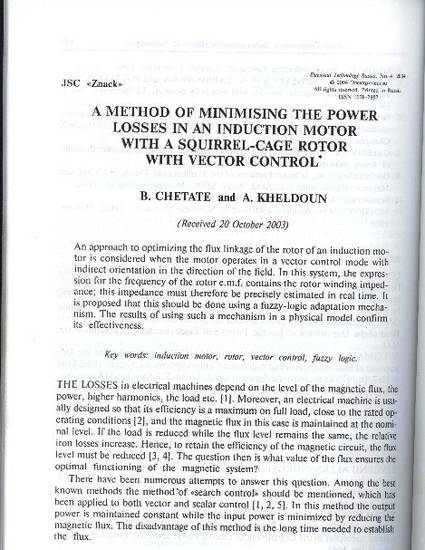 Key words: induction motor, rotor, vector control, fuzzy logic.